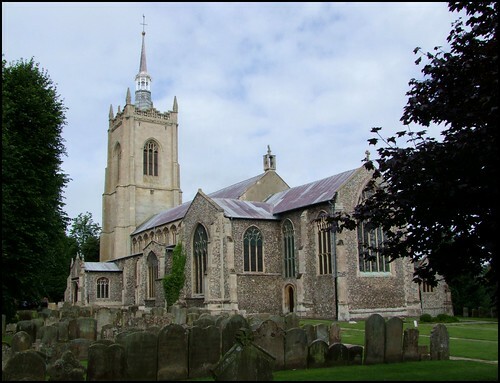 Swaffham is the most elegant of Norfolk's smaller towns, and, architecturally at least, its parish church is one of the great East Anglian small town churches, to be mentioned in the same breath as the likes of Dereham and Bury St Mary. It sits close to the western edge of its graveyard, a passageway leading through from the west doorway to the market place, a pleasingly organic juxtaposition. The glory of St Peter and St Paul is the tower, which went up early in the 16th Century on the eve of the Protestant Reformation. Another twenty years or so and it would not have been built.Like that at Cawston, it is made of rugged Barnack stone, and is fabulously decorated with symbols, most notably the large wheels containing the crossed keys of St Peter and the crossed swords of St Paul, which appear around the base course. There are blank shields between them, and the whole base course must surely have once been painted. The beautiful lead and wood fleche on top of the tower is 19th Century, but replaced a similar earlier structure. There are aisles and clerestories to north and south, as well as a large transept chapel on the south side. The graveyard stretches away to the east, with no shortage of 18th and 19th century gravemarkers of considerable quality in terms of both stone and inscription, a suggestion of quite how wealthy this town has been over the last few hundred years. On the occasion of my visit, the graveyard was a busy place in a different sense, because on a Saturday morning they serve tea and cakes inside the church, and so the west end of the graveyard was also full of the cars of the ladies on duty. It is worth pointing out that parking in Swaffham on a Saturday morning can be difficult, because of the popularity of the market. It is easier to park in the afternoon, but I am afraid that this church is only open in the morning on a Saturday. You enter the church through the fabulous west doorway, surely one of the grandest entrances to any Norfolk church, and the sheer bulk of the building spreads out before you. This is a church which seems larger inside than out. The space is topped off by a breathtaking late medieval angel roof, which is said to be chestnut (although I have heard of several medieval chestnut roofs in East Anglia which, on proper investigation, turned out to be oak after all). Perhaps inevitably, St Peter and St Paul underwent as extensive a restoration in the 19th Century as any small town church, giving it an overwhelmingly urban and somewhat anonymous character. Nevertheless, there are some good early survivals other than the roof, the best of which are perhaps the figures on stalls in the chancel which peer out, rosaries in hand. They must be intended as 15th Century townspeople - I wonder if they were carved from the life? Opposite them is a man and a dog, the Pedlar of Swaffham, of which more in a moment. More famous than these medieval carvings are the 19th Century representations of the Pedlar of Swaffham and his dog are on the most easterly bench ends in the nave. In the legend, John Chapman, the pedlar in question, learns of the whereabouts of a large sum of money in a dream, and gives it to provide the church with a niorth aisle and the magnificent tower. Interestingly, the upper lights of the north aisle are now filled with figures in 15th Century glass, some of which are angels, but some of which are clearly donors. There are more medieval panels in the west window. The best-known glass in the church, however, is in the south transept, the former chapel of the guild of Corpus Christi. This is now the WWI memorial, and its main feature is a large window by Morris & Co. The four main figures are St George, St Martin, St Michael and the Blessed Virgin, but perhaps more interesting are the smaller panels at the bottom, which depict the fighting at Zeebrugge, Jerusalem and Mons, and a scene inside a field hospital. The archangel Michael is shown above the scene of Mons, on the Western Front, where it was widely believed at the time that a host of angels had led the British troops into battle. There is a lot of other late 19th and early 20th century glass in the church, some of it good. In general, the restoration of the nave was very successful, but that of the chancel perhaps less so. John Botright, the 15th century Rector of the church who oversaw the rebuilding at the expense of John Chapman and who was responsible for rebuilding the chancel himself, lies in effigy on the northern side of the sanctuary. Unfortunately, he suffered the ignomy of having his tomb canopy lowered by the 19th Century restorers. The jagged cusping of the arch comes down to just above his body, to the extent that it rather looks as if he is being eaten by his own tomb. My favourite part of the church today is, I think, the south aisle chapel. It has been boldly reordered so that a circular communion rail and kneelers surround a simple altar and a beautiful wall hanging. It is done very well, and I couldn't help wondering what Katherine Steward thought of it. She died in 1590, and now kneels piously regarding it, holding a huge hideous skull in her hands. What gives her added significance is that she was Oliver Cromwell's grandmother. More alarming even than Katherine Steward's skull is an inscription on a modern brass nearby to the Splendid Memory of Harold Frederick Ellwood Bell ICS, who was killed by a tiger in 1916 while safeguarding some of the natives of his district. I assume that he suffered this fate in some far-flung corner of the British Empire rather than unexpectedly in a local field - although, of course, strange things do happen in Norfolk.